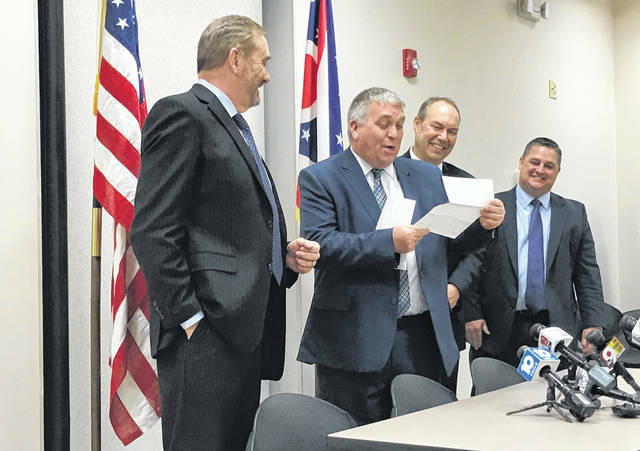 Pike County Prosecotor Rob Junk, second from left, is all smiles after Ohio Attorney General Dave Yost handed him a $100,000 check to help pay for prosecuting the Rhoden murders. Looking on are, from right, State Sen. Bob Peterson, R-17, and State Rep. Shane Wilkin, R-91. Wilkin and State Sen Bob Peterson, R-17, were on hand Friday as they are working on legislation Wilkin said they hope solves the problem of paying for capital or death penalty cases around Ohio. Wilkin said he and Peterson met with representatives from the attorney general’s office, a county commissioners association, state prosecutors and numerous other officials to hammer out the final details of their legislation which they introduced to the public back in November. https://www.recordherald.com/wp-content/uploads/sites/27/2019/02/web1_yost-etc.jpgPike County Prosecotor Rob Junk, second from left, is all smiles after Ohio Attorney General Dave Yost handed him a $100,000 check to help pay for prosecuting the Rhoden murders. Looking on are, from right, State Sen. Bob Peterson, R-17, and State Rep. Shane Wilkin, R-91.